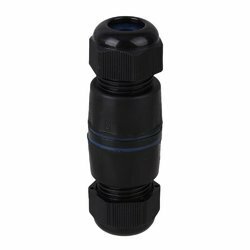 Wholesale Trader of a wide range of products which include one in and 3 out ip 68 connector with cable gland and ip 68 single connector with cable gland. IP 68 connectors with one in and 3 out with built in terminals and cable glands. with one piece moulded gasket. Long life and also can be used in very dusty and wet environments with total safety. No need for seperate junction box. shock proof and impact resistant. IP 68 connector with gland combinartion.